Prague was on my “places to visit” list since a long time ago, but somehow I never made it there until now. The city by the river that most know because of its numerous bridges and the beauty of its old town architecture is like a little gem. The streets of the old town are like a labyrinth and getting lost on them is not a bad idea, actually. As I have the habit of not using maps and just walking wherever a nice street takes me, I ended up seeing a lot of unplanned and unexpected things and probably missed just as many. The vibe of the city depends on which side of Vltava one is, and it took me a few days to find that out. While looking around and enjoying the delicious Czech food that reminded me so much of the one in Western Romania, I started planning an itinerary that had nothing to do with the touristic landmarks of the city in the classic way, but to seeing as many sites from INXS’s “Never Tear Us Apart” video. A few months ago when I found out I’d be going to Prague in May I was kindly provided with a list of 50 videos shot in the city. Some more interesting than others, some I’ve never heard of, some worth all the attention, and a few of them worth retracing the steps of the video shots. I’ve settled on “Never Tear Us Apart” because I like it, it is a beautiful song, it shows the full charm of the city and there is a map on Google of the sites of nearly every frame in that videoclip. So there I was walking the streets of Prague trying to figure out in which moment of the video I am just by sitting and staring at the walls of the Jewish Cemetery, for example. Oh the excitement in the evening when, after my long walk, I watched the video again and could happily say “I was there, uh and there, and there, seen that too, yay!” (The Jewish Cemetery, Charles Bridge, the island, the stairs, the city view, The Old Town Square, the places where the guys playing the violins are). It was impossible not to make this song the soundtrack of my trip to Prague just as well as it is impossible not to say that now I want to go and see the city in the Autumn, on a cold, gloomy, misty day, just like the one in the video. And because now, at the end of May, I found Prague to be suffocated with tourists, so I would really like to se it when it’s less crowded and cold. 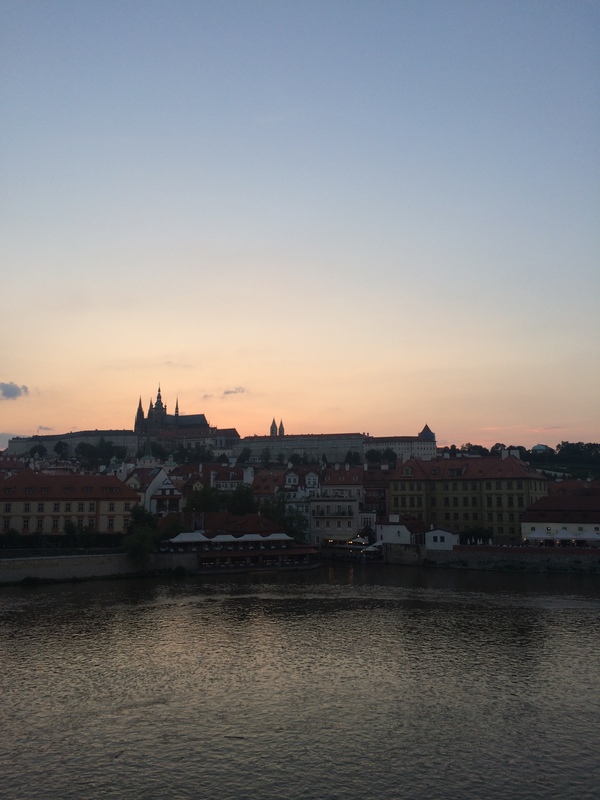 Jumping from one Czech restaurant to another meant trying as many local dishes as possible. Hard to decide if I liked the goose or the pork better but I can say that the cabbage and the beer make every meal great. And the apple strudel. Though they are fighting for the authenticity of some dishes with the Austrians and Hungarians, they nevertheless serve delicious food. The “I’m a tourist” part of the journey was just a small piece of the trip itself, as the purpose of my visit was work, not just playing tourist. Some mornings have been taken by putting things in order for the conference I was attending, other parts of the days were spent in panels listening to academics share their wonderful research or wondering how some of them can’t determine me to make sense of what they were saying. But in between listening and talking to people coming from all around the World, enjoying the food, meeting friends and colleagues, my thoughts would briefly be interrupted by a question: “what song’s next?” So then I move to another band that is ever so dear to me and one of the most beautiful songs ever, and one of my favourite songs ever: HIM’s “The Sacrament”. One can see a bit of Prague in it. I can’t tell which part of the city I liked the most, but I am pretty sure all my favourites have at least a corner from which I could see the river. The old city with its buildings and narrow streets, cozy coffee shops and restaurants, tourist traps, speeding drivers and tens of thousands of tourists are there to take ones mind away from the fact that not a long time ago, though people seem to forget that, Communism was trying to dehumanise every living creature and make her or him bow its head in submission. 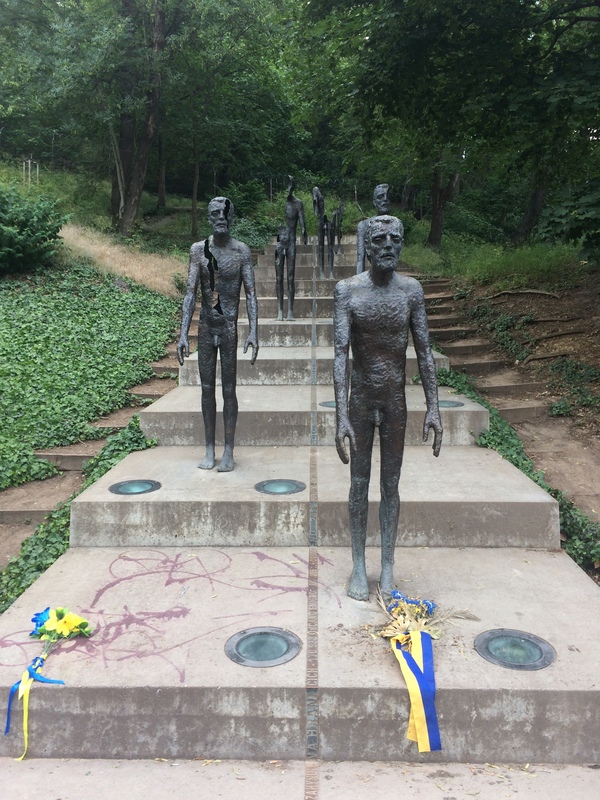 All is fine until you end up in front of a set of statues that represent The Memorial to the Victims of Communism. It gave me shivers down my spine, not knowing right away what it was about but understanding just by the look of it that whatever it is a placeholder for, that thing should never happen again but should never be forgotten either. Other traces of a dark past are hidden far away from the eye of the enchanted tourist, on the outskirts, in tall blocks of flats that look like matchboxes. Others probably still hide in the eyes and the souls of those who experienced those times. Many can see them in the Museum of Communism. In essence Prague offers a little bit of each world. Its beauty is nevertheless undeniable. This entry was posted in Away, Day to Day, English, Music Stuff and tagged Communism, Czech Republic, HIM, ICA, INXS, Prague. Bookmark the permalink.